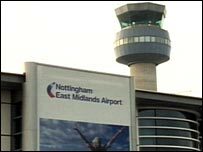 Managers at Nottingham East Midlands Airport have announced the site's new name will be East Midlands Airport - Nottingham, Leicester, Derby. The change takes place with immediate effect and is one of a number of pledges put forward in the airport's master plan for 2006. Improvements also include tougher penalties on night flights and better compensation for nearby residents. But Nottingham City Council's leader said the move was "absolutely mad". Dismissing criticism on another name change in just three years, the airport's managing director Penny Coates said the decision had been welcomed by business leaders. "We believe this change is the right commercial decision now, given our clear growth strategy. "In making any change, our objective is to provide a strong platform both for the long term development reflected in the master plan and for the future needs of the travel trade." Since the name was changed to include "Nottingham" in the title, passengers were felt to be unhappy as the airport is located in Leicestershire, but Derby is actually the closest city. But leader of Nottingham City Council, Jon Collins, said the change was a blow for the people of Nottingham. "I think it's absolutely bizarre and I'm absolutely amazed that any human being could have thought this was a better name for the airport. "I think it's a completely mad decision, taken without any consultation with the people of Nottingham and most people will see it as a slap in the face for Nottingham. It's a real shame," he said. But representatives from Derbyshire and Leicestershire said the name change was a positive step. George Cowcher, chief executive from the Nottinghamshire and Derbyshire Chamber, said: "It was fairly divisive when Nottingham was included in the title three years ago but we're now back to better regional cohesion. "This puts the East Midlands on the map and is really making sure that this region and these three cities [Nottingham, Leicester and Derby] can range themselves against the biggest and most powerful cities in the country. "Bringing the three cities together like this is a much more sensible decision," he said. Martin Traynor of Leicestershire Chamber of Commerce said: "The fact that we have had an airport that is actually located in Leicestershire called Nottingham East Midlands Airport is a bit bizarre. "We welcome the change - the airport represents the whole region."